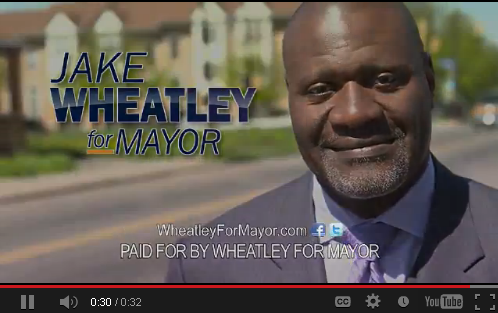 The Jake Wheatley for Mayor campaign is on the air with its first commercial…sort of. The new ad, called "Fairness," is an online-only advertisement that will be targeted to individuals based on their Internet usage says Wheatley spokesman Daren Berringer. The press release announcing the ad uses words like "attitudinal criteria" to explain the technology. But basically, the campaign is using a marketing company that tracks Internet information to find out where a person lives, targeting those in the city, and identifies likely voters through their web activity: Have they, for example, taken a political survey? The commercial will then be shown to targeted individuals through video advertisements sold on websites across the web. Berringer says it allows the campaign -- which collected about $62,000 in donations -- to better direct its message. "If we're going to be spending money on advertising this gives us a much better reassurance that the ad is reaching its audience," says Berringer, who anticipates the ad getting about 400,000 views between now and the end of the election. "If we buy a TV ad at midnight and no one is awake to watch it, what good was it? "Even if we had more money to spend on advertising, we would do this regardless." Adds Wheatley in the campaign press release: "We're optimizing our reach and spending our resources wisely." The ad features Wheatley, a former marine and current state Rep., standing on Frankstown Ave. in Homewood. "[F]or Pittsburgh to be successful, we have to end the politics as usual and move our city toward innovative ideas that will unite is and bring about economic fairness," Wheatley says in the spot.